First of all Happy New year to all my blogger friends and readers.This year i want to start my blog with a dessert ,so i have prepared Oaty Apple Crumble yesterday.Here goes the recipe..
Cook the apples with the caster sugar in a large pan, stirring occasionally – add a splash of water if they start to stick on the bottom. When just about tender and a bit saucy and tip into large ovenproof dish. 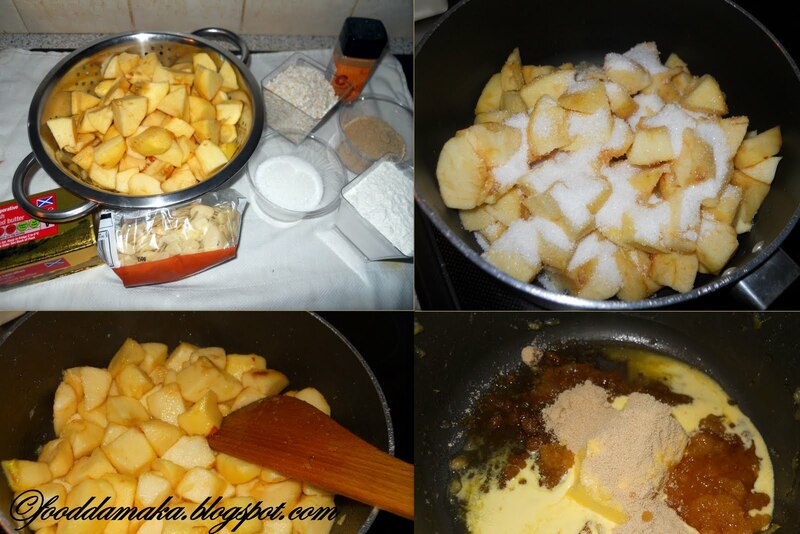 Melt the brown sugar, honey and butter together in a large pan. Off the heat, stir in the oats, flour, almonds and cinnamon until sticky and crumbly. Divide over the apples. To bake straight away, heat oven to 160C fan then bake for 40-50 Min’s until topping is golden and crisp.Once its cooked remove from the oven and allow to cool.Enjoy tasty and yummy crumble with ice cream or like it self. Delicious Crumble. Wishing you and family a happy and prosperous New year. Happy New Year to you also dear !! Crumble looks wonderful !! Perfectly done !! Simply marvelous looking oaty apple crumble. Would love to try out at least once. Happy new year wishes Pavani,crumble looks seriously marvellous,healthy and inviting. Wish you and your family a very Happy New Year…super delicious recipe.